Pictured above: Jack Venton as Romeo, Annie Gorenflo as Mercutio and Amanda Matousek as Benvolio. 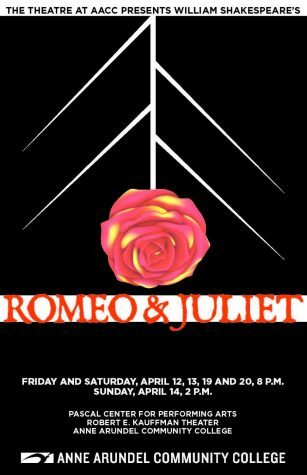 “Romeo and Juliet” opened Friday night to an eager audience. The visual effects were enchanting as both music and video projections amplified the mood either by blanketing the young lovers in stars or bathing the stage in red during Mercutio’s murder. 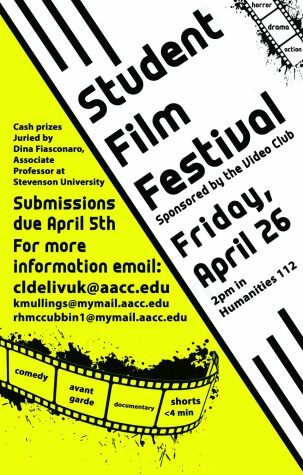 While the performances of AACC alumni Jack Venton and second-year transfer studies student Katie Laubert as the lead roles were highly anticipated, the emotional intensity of the supporting cast was breathtaking. Shayna Bloom, a second-year theater student, helped open the play with a dynamic performance as Sampson, a Capulet friend who “bites his thumb” at the Montegues. When challenged by the rival clan if she insulted them, Bloom stage whispers to her co-conspirator, “Is the law on my side if I say ‘yay’?” She is warned “No,” so she loudly shouts, “Nay!” And an amused audience erupts in laughter. Bloom further showcases her comedic skills as she scurries around stage dodging dangerous swords. 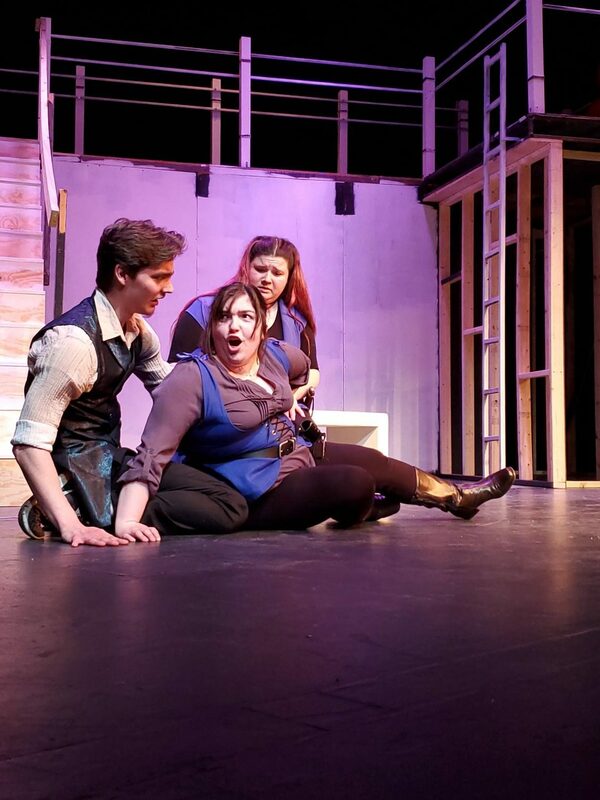 While Bloom and the other members of the battling clans, Annie Gorenflo as Mercutio, Amanda Matousek as Benvolio, and Austin Japak as Tybalt, were exciting to watch on stage, their costuming became confusing at times. Female-identifying actors superbly performed the traditionally male roles of Romeo’s friends, the prince and Friar John. But at times feminine hairstyles and mannerisms — and costuming in the case of Bloom’s wonderful swashbuckling red bodice as Sampson — made the gender swaps less than obvious. “Twelfth Night” and “As You Like It” offered effective examples of tricky yet convincing gender-bending. Despite the gender-confusing costuming, the supporting cast delivered engrossing performances. Annie Gorenflo, third-year culinary student and “Hairspray” alum, wore the prince’s crown well while issuing warnings to both houses against fighting in the streets. But the big laughs were elicited by AACC community member, Allen Cole, as Friar Laurence. His high, whimsical voice dominated the stage even as he was simply speaking to a basket of flowers that could cure and kill, depending on the use. His scenes later with Romeo elevated Venton’s performances to some of the most subtly engaging of the play. As the play progressed, it quickly became clear that this was an intriguing tale of two couples as illustrated by the dance where Romeo and Juliet meet. This love metaphor was a key scene for the play but also one where mature love contrasted with the forbidden kind. While Lambert’s and Venton’s movements were timid and uncertain, Bloom’s and Cole’s — as Lady and Lord Capulet — were comfortable yet complex as an older married couple. It was interesting to watch as Bloom danced with her “husband” but tried to silently alert him to the budding attraction between the young lovers. Cole was wonderfully oblivious to his “wife’s” distress and enjoys the ignorance that is his bliss. The contrast between the couples made the scene dynamic and exciting to unravel. The director, Dr. AnneMarie Saunders, theater department, did an incredible job choreographing not only this scene but others in the play so theatergoers saw the play with new eyes. If the first half of the play was comedic in tone, the second half was definitely tragic as death followed death, beginning with Tybalt’s and careening towards the loss of both lovers. 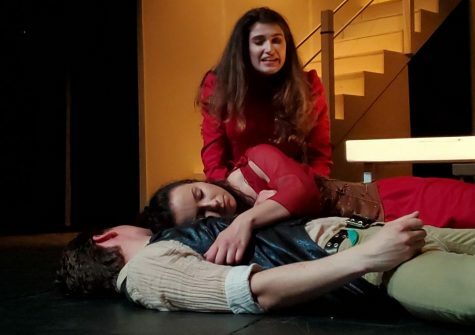 While the final death scene is the most familiar, a strength of this play is how it handled the death of Tybalt which motivated the lovers’ eventual demise. “Romeo must not live,” Bloom’s Lady Capulet said coldly to Laubert’s inconsolable Juliet. The magic of Bloom’s and Cole’s performances as Lord and Lady Capulet dominated the second half of the play, beginning with their silent hug over the corpse of Tybalt and ending with their fury when Juliet refuses to marry Paris. Their performance as parents of a starry-eyed teen was entirely believable, proving the wisdom of their casting. At the play’s end, when Amanda Matousek returned to the stage as Lady Montague to lament the loss of her husband and now her son, her previous role as Benvolio was forgotten and the audience responded well to her as a grieving mother who embraces Lady Capulet as the only one now who can understand her pain. It is rare in a play that even after the leads have met their unfortunate end, the supporting characters still shine and leave the audience asking for more. 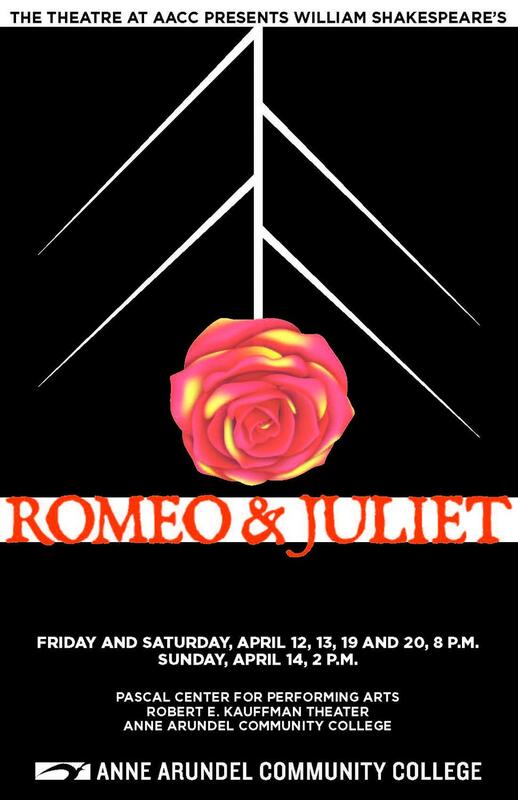 “Romeo and Juliet” continues to run on April 13, 14, 19, and 20.